A little bit of color can go a long way when using rich hues. By adding a few key accessories you can bring your room from drab to fab just in time for summer. Take these rooms for example. Fuchsia curtains and a magenta bouquet bring this monochromatic room to life. Both bring big change to the room with little effort and no permanent changes. 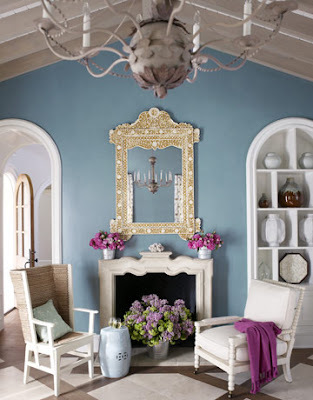 By adding a few floral arrangements and a throw this room goes from calm and cool and to fun and flirty. The turquoise stools pair well with the fuchsia bench. They both create a great amount of interest to an otherwise bland color palette. This teal desk and tomato orange chair add so much charm to this room. Painting a piece of furniture in an unexpected color is a great way to reinvent a space for little cost.